A few final copies were delivered to me on Saturday. 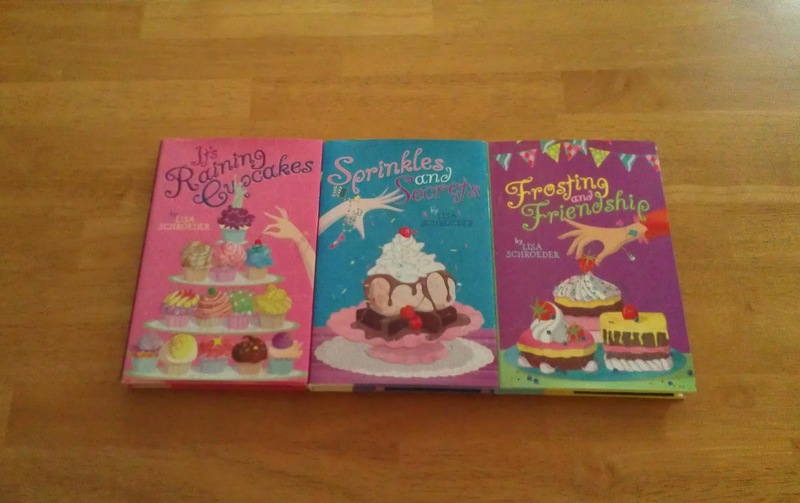 So here is the latest book, Frosting and Friendship, cuddling up to the other two, It's Raining Cupcakes and Sprinkles and Secrets. Three is definitely not a crowd in this instance, right? Wow, I haven't blogged in a while. I'm just so busy, writing books and editing other books and basically trying to keep my head above water at this point. It's all good, of course. The work now means many books to come next year and the year after, but still. It's work, and my brain is tired, so it's hard to find the brain energy to do much of anything beyond the work that is required. It's summer, though, my favorite season here in rainy Oregon, so I've tried to get out and have fun on the weekends as much as I can. 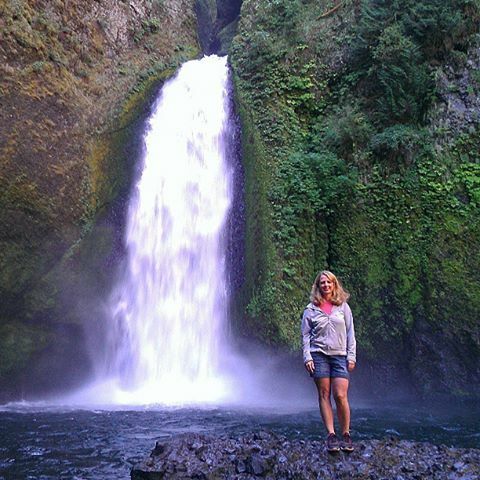 Here's a picture of me on a hike last weekend in the Columbia River Gorge. (Wahclella Falls, Exit 40, if you're local and looking for an easy and pretty hike to do. It's only a mile in to see the falls, and this trail is much less crowded than the popular trail to Punchbowl Falls). Anyway, I was thinking last night about the cupcake "series" that will soon be coming to an end. (One more month, as of today, and Frosting and Friendship will hit the shelves!) I cannot even tell you how grateful I am to have had the original idea to write a book about cupcakes and friendship. I can still remember the exact place and the exact time when the idea for what eventually became It's Raining Cupcakes came to me. Not all books have this exact moment kind of thing as far as the idea goes. And it's kind of fascinating to me. There are really only two books out of the eight novels I've published thus far when there was this big "A-Ha" moment about the book and it was so strong and so powerful, I remember it like it happened yesterday. The other books came about more slowly, maybe after writing in my idea journal or after playing around with words or even entire books that eventually led me to the right place. The interesting thing, however, is that those two books (the ones where the ideas hit me like a bolt of lightening and I couldn't wait to get to the computer to start writing) have been my most popular books. I'm going to be honest and say that I kind of feel like it's divine intervention, giving me what I need at the moment I need it. It's a wonderful thing. The first time it happened, I had a dream about a girl whose boyfriend died, but he loved her so much, he didn't want to let her go and so, he came back as a ghost. I woke up with this strong sense of love, and it was like - BAM, this is going to be your next book! I couldn't wait to get to the computer and start writing down this girl's story, and I did, that very morning, before I had to get ready for work. I Heart You, You Haunt Me came from that dream. With It's Raining Cupcakes, I was brainstorming ideas on the drive home from work, desperately wanting to write a middle grade novel that would be fun and happy-making. I hadn't published any middle grade novels, and I really wanted to, because I have such fond memories of books and reading during that time in my own life. When the idea for setting a book in and around a cupcake shop popped into my brain, again, I couldn't wait to get home and start writing. It was just what I needed at the time, and Isabel's story poured out of me. I love that excitement and sense of urgency, when you know you're on to something good. I was recently reading something on the internet when an idea struck and I'm in love with the idea, but unfortunately, right now, I'm too buried in other work to even begin to think about it. So, I've scribbled in my idea journal for now, and that will have to do. Kids love to ask authors where they get their ideas. I always say mine come to me in lots of different ways, and give some examples. But I can't deny my favorite way is when the idea hits in a big, big way and you know you're on to something good.